This past week was so intense, I didn't have much time to contemplate the sky. Next week will be better, and I can lift my face from my work to look out the window. I believe I would be looking up too! Oh i think i would be watching as well. Well it sounds good that you have a job. Cool picture. 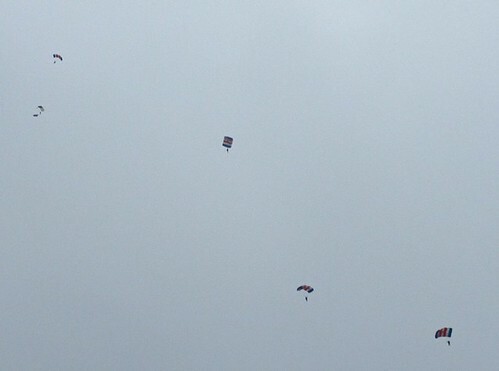 The parachutes are nicely spread through the picture. That is a great catch. They look like tiny birds they are so far away. Oh that is wonderful, folks floating through the sky. Good luck on all your work. What a great shot. You were in the right place at the right time with your camera. I would be watching too...thanks for sharing this. Wow that is alot of parachutes, great shot.